Service conditions…what impact do they really have? The ASTM F2170 standard mandates measuring relative humidity (RH) at service conditions. But your project’s timeline may be such that you’d like to be able to estimate RH before reaching service conditions. Unfortunately, especially in new construction environments, the required service conditions don’t exist early on. Wouldn’t it be great to have a tool that allows you to estimate the RH in the concrete slab once service conditions are met, and to be able to do this quickly and easily? Good news! Now there is just such a tool. Wagner Meters is proud to share the Service Temperature Adjustment Chart shown below. It’s a valuable science-based, estimation tool developed by CTLGroup, a wholly-owned subsidiary of the Portland Cement Association. 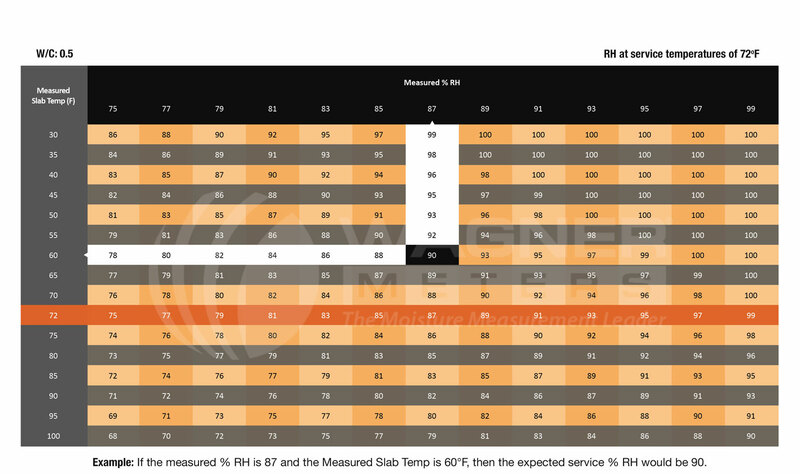 This table is quite simple to use, once you’ve obtained the RH and temperature readings of your concrete slab using your Rapid RH® kit. Learn more by clicking on the video, then download the table and start putting this helpful tool to use. Now you’ll be more confident about making decisions related to concrete moisture, even before you’ve reached service conditions. DISCLAIMER: Neither Wagner Meters nor CTLGroup has control over the equipment to be used nor how the testing is to be performed, and therefore, shall not be responsible for any consequences resulting from the use of this data and table. The estimations provided by this table are based on experimental data acquired by CTLGroup under laboratory conditions. This information, therefore, should be used for estimation purposes only, and should not be relied upon or used as a replacement for, or in lieu of, testing as outlined in ASTM F2170 testing standards. The table’s estimated results are applicable only to concrete at w/c = 0.5 and to mixtures that do not contain SCMs (fly ash, slag cement, etc.) Neither Wagner Meters nor CTLGroup shall be liable for any damages, whether actual, incidental, or consequential, associated with the use of this data, table, or calculator applications, or any inaccuracies or errors therein. ©2015 CTLGroup, All Rights Reserved. The estimations provided by this table are the property of CTLGroup and have been licensed to Wagner Meters for use by customers of Wagner Meters only.